Millbrook quill course will always hold a special place in my heart. This page is dedicted to Muriel Gloade who took my course the three times I offered it and was able to finally finish her basket. She was a dedicated artist even if she didn’t know it. 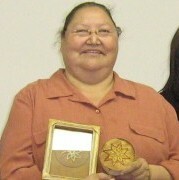 I was honored to be her teacher and blessed that she taught me some very important Traditional knowledge she had. Thanks Muriel you will never be forgotten. Our classes were a mixture of finding bark in July and learning how to dye quills in August. We travelled to Halifax Musuem to see the quillwork that they have in storage. I am always amazed how beautiful our ancestors did this beautiful art form with so little tools. i was so proud of having muriel take the course with us, she was an awsome woman who had some much knowledge to share with us.